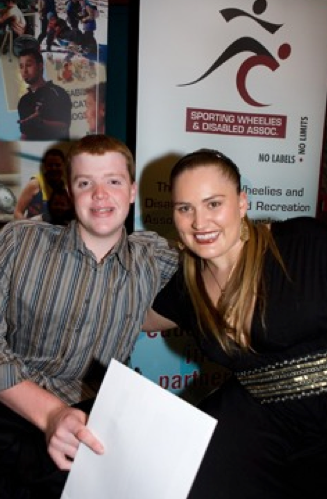 Sam is a promising young wheelchair racer who broke the national age records for the 100m, 200m and 400m during 2008. 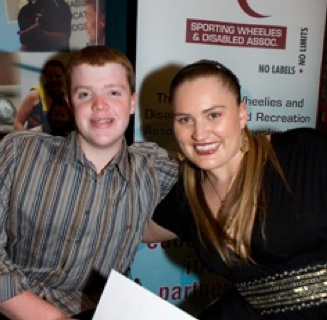 He took up wheelchair racing in 2001, the same year he competed at his first Junior Nationals at Nudgee College in Brisbane. At this meet Sam, who was born with spina bifida, was classified as t54, which is for athletes who are in a wheelchair due to spinal cord injury or amputee athletes. Since then he has established himself as one of Australia’s best T54 male racers. He won bronze at the 2008 national championships, competing in open competition against adults. He has also competed in half marathon events. During 2008 he also completed successful tours of the United States, Canada and Switzerland where he was part of the men’s 4 x 100m relay team that won gold for Australia. These trips, plus the required equipment cost Sam’s family $12,000 in the past year. Sam now needs an upgrade of his equipment, including a new frame and discs for his racing chair. So there is no doubt his Sporting Dreams development grant will come in useful. On top of his outstanding sporting skills, Sam displays leadership skills and was named Queensland captain at the last Junior Nationals. Sam’s father says these experiences have produced a new found professionalism and he is aiming for the very top. Sam is now progressing through years 11 and 12 at high school in Toowoomba, where he has chosen to distribute the workload over three years so that he has more time to focus on his sport. He hopes to compete in London 2012. Nice information, appreciation for posting. This excellent website has some really helpful facts about it! We appreciate you informing me.